A consultation is required first to determine the best treatment for you. PLEASE: Read our Pre/Post Instructions to be prepared for your appointment. 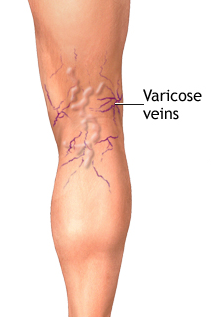 Varicose Veins are swollen, twisted, blue or purple veins that can be seen under the skin’s surface. They result from a weakening in the blood vessel wall or from faulty valves. They can show up anywhere on the body but most often appear on the legs or pelvic area. Spider veins are a smaller version of varicose veins. They affect the capillaries, the body’s smallest blood vessels. 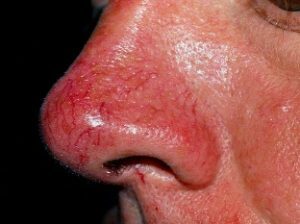 Spider veins, which are red or blue, look like a spider’s web or tree branch, and they tend to appear on the legs and face. Although varicose veins and spider veins are common, many people find them unsightly. Varicose veins can also cause unpleasant symptoms, such as tiredness, itching burning, throbbing, tingling, heaviness, soreness, or swelling in the legs. Not standing or sitting for long periods without taking a break. Losing extra weight to improve blood flow and ease pressure on your veins. Not wearing tight clothing, especially around your waist, upper thighs, and legs. Tight clothing can worsen varicose veins. Not wearing high heels for long periods. Shoes with lower heels can help tone calf muscles and improve blood flow through the veins. Elevating legs while sitting, resting, or sleeping — ideally, to a level above your heart. Avoiding crossing your legs at your knees and ankles. Doing physical activities that move your legs, which will improve muscle tone. If your Provider recommends them, consider wearing compression stockings. These stockings create gentle pressure up the leg. That keeps blood from pooling in veins and also curbs leg swelling. You can buy compression stockings in pharmacies and medical supply stores. Usually, varicose veins don’t cause medical problems. But in some people, they can lead to pain that interferes with walking or standing. They can also cause blood clots, skin ulcers, infections, and other troubles. If lifestyle changes don’t help, if varicose veins become more severe, or if you’re bothered by the appearance of your varicose or spider veins, talk to your doctor about what medical treatments are available. Although rosacea can affect all segments of the population, individuals with fair skin who tend to flush or blush easily are believed to be at greatest risk. The disease is more frequently diagnosed in women, but more severe symptoms tend to be seen in men — perhaps because they often delay seeking medical help until the disorder reaches advanced stages. While there is no cure for rosacea and the cause is unknown, medical therapy is available to control or reverse its signs and symptoms. 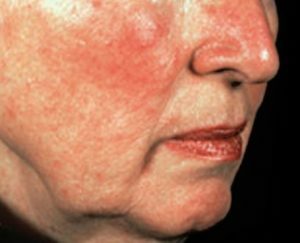 Individuals who suspect they may have rosacea are urged to see a dermatologist or other knowledgeable physician for diagnosis and appropriate treatment.